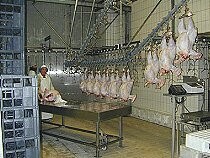 An international company of poultry production plans to optimize the existing production process from processing to delivery as well as compiling the respective functional specifications and cost planning. An international company in the meat processing industry aims to strengthen its regional shipping and delivery of gastronomy products by incorporating a fully automated buffer warehouse for euro boxes with an integrated transport logistics and advanced picking technology. By means of retrofitting and use of existing space, preparation of project requirements specifications for all production units the investment costs could be designed so favorable that one can expect th payback period of 2-3 years. 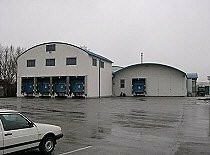 A former production plant should be retrofitted into a freah meat logistics center for a food products chain. The special requirement was a concept of eliminating downtimes and reuse of existing machine technology with maximum cost savings.